For non-duplex scanners you have problems with front / back sorting to get the right order in the PDF for the printout! 1.) ... The duplex problem with non-duplex scanners! 2.) ... The duplex problem with non-duplex printers! 3.) ... Auto rotate every second page, before create a PDF! Advance! The problem description does not cover duplex scanners. Full Duplex scanners sort anyway automatically! Advance! If you own a multifunctional duplex printer it is not at the same time a duplex scanner! 1.) The duplex problem with non-duplex scanners! Of course you want to have them in a stored document in the right order. Right Click on List View ► Duplex ► Use sorting for non-duplex scanner. Info: If this does not mean anything to you, do not worry, then you do not need this feature. Just ignore it :-). 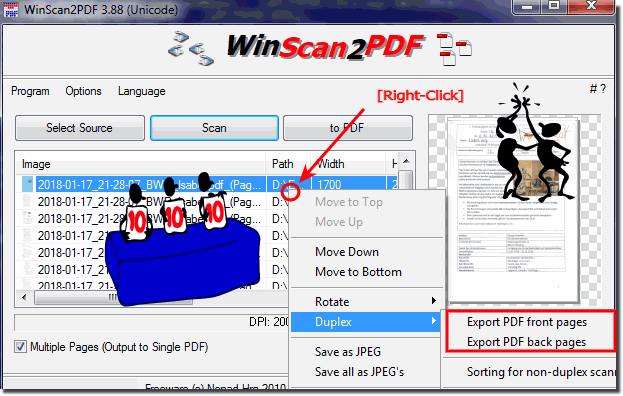 See also: ► How to uninstall WinScan2PDF? 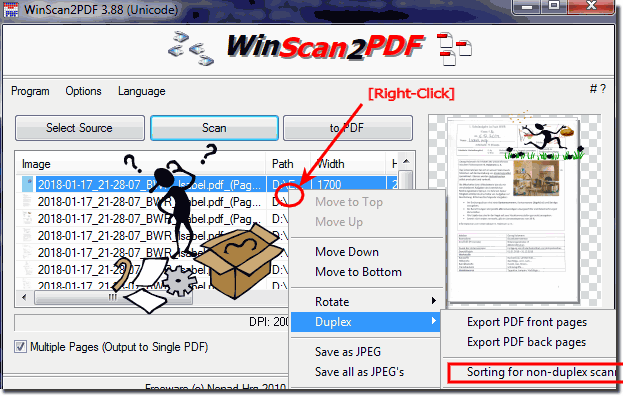 (Image-1) sorting non duplex PDF scanning and printing! 2.) The duplex problem with non-duplex printers! It is very handy if you have a non-duplex printer. Then from WinScan2PDF 3.88 you can easily save the front pages as a PDF and save the back pages as a separate PDF file. (Image-2) PDF printing non duplex Printer! 3.) Auto rotate eevery second page, before create a PDF! From Version 4.63, the back side can be automatically rotated correctly before the PDF is created! Is good for older Duplex-Scanner! (Image-3) Flip ergo Rotate back pages for duplex PDF scanning! Unfortunately, with older Duplex-Scan over the feeder the back is always rotated by 180 °. So if, for example, 10 pages scan by feeder, the pages 2,4,6,8 etc. are rotated by 180 ° and I do not have to manually rotate these pages. 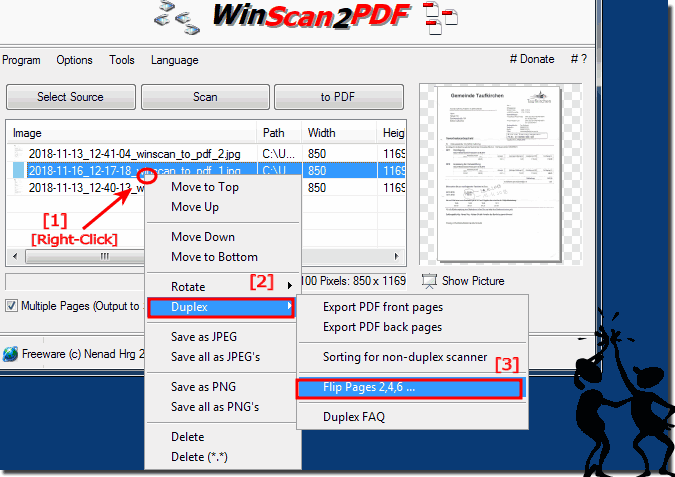 WinScan2PDF - FAQ-15: Front pages, back pages, sorting, duplex PDF scanning and printing! I'm just struggling with duplex scanning, desperately looking for the duplex setting. How can I tell the program to scan the paper in the printer feeder from both sides? So again my wish: I scan the stack twice: 1.) once front, 2.) once backs: Of course I want to have them in a stored document in the correct order. If I understand you correctly now, then you want printers serve. which are not duplex capable. Of course that's a good idea, if that's what it means. I did not remember because my printers are duplex. But the scanners are not .... (On occasion I would like to learn how to become such a program crack and write programs that are so good and so compact. Today, every Windows program has at least 50 MB, and not 50 KB like yours.)? Hello, I have a request or suggestion for the program WinScan2PDF. It seems to be good, as are all your programs. I am currently using QDir and I am quite satisfied. Now I came across WinScan2PDF - but have not tested yet, because I miss something essential. Namely the ability to do "duplex" on non-duplex scanners. THAT would be a real trial solution for many people. So scan leaves, turn around, scan again - and sort the program ..... Then you could disconnect from programs like Paperport, which are too buggy anyway. Since sorting is already included in the SW, this change would not be a big challenge for you. ?